VISAKHAPATNAM: The postal department will use new technology to provide quick service to customers and introduce new products to generate revenue, Chief Post Master General of Andhra Pradesh Circle B V Sudhakar said here today. Launching a smart phone-based Andriod solution to monitor letter box clearance at the Lawson's Bay Colony post office here today, he said that the facility is now functioning at Hyderabad and Vijayawada. The facility will enable people and the postal department to know the status of letter box clearance and its dispatch to customers through a a smartphone which would be given to postal clearance personnel who clear post boxes. 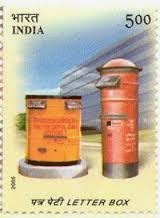 He said that 700 post boxes are being monitored using the solution, which would be extended to more than 500 post boxes in Visakhapatnam in a phased manner by February 2015. He said that the Andhra Pradesh circle has decided to sell Tirumala Darshan tickets of Rs 50 and Rs 300 denomination through all 95 head post offices in Andhra Pradesh and Telangana region from January 5, 2015. The facility would be extended all sub-post offices in the circle from February 2015, he said. He said that the postal department had already begun selling non-judicial stamps through post offices in the Telangana region. Cashless transactions would be introduced in post offices in the rural areas, he said. He said that payments for registered post, parcels and other services would be accepted debit and credit cards by installing swiping machines at post offices. In rural areas where there is no banking facility, the postal department would allow customers to draw upto Rs 1,000 from post offices. He said that the postal department's revenue deficit had come down from Rs 465 crore in 2011-12 to Rs 265 crore in 2013-14, adding that it has been planned to wipe out the deficit in 2014-15.